• Brand: Sukkhi • Product Type: Combo• SKU: 184CB6100• Colour: White and Golden• Material: Brass• Plating: Rhodium and Gold• Stone Used: Mixed Stone• Design: CAD/CAM• Dimension: Product 1: Necklace: L : 9 B: 2 Earring: 1.5 inches Weight: 50gProduct 2: Pendant : H: 2.5" B: 1.5" Earring: H: 1" Weight: 25gProduct 3: Necklace - 3.0inch / 4.0inch Earrings- 2.75inch / 1.25inch Weight: 50gProduct 4: Weight: 15gProduct 5:Product 2 : L - 4 cm Product 3 : L - 3.5 cm Overall Weight : 30gProduct 6: Ear cuff: L: 4.5cm Weight: 10gProduct 7: Weight: 1gOverall Weight: 181g• Available Size: Bangle Size: 2.4,2.6,2.8,2.10• Email Size To: bhaveshjnavlakha@gmail.com• Description: This Sukkhi Pretty 10 Piece Fashion Jewellery Combo has wonderful look and is perfect for casual wear. 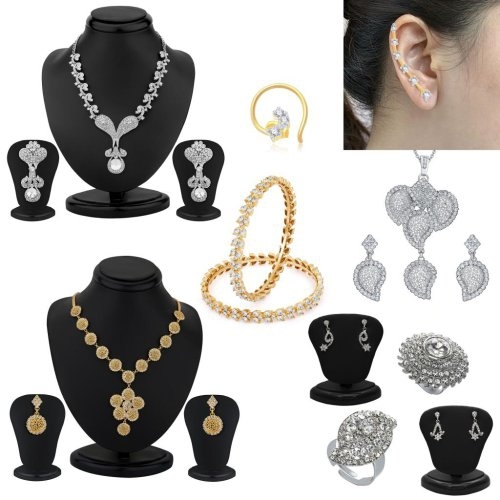 It includes 1 Bangles, 1 Pair of Ear cuff, 2 Pair of Earring, 2 Ring, 2 Necklace Set, 1 Nose Pin, 1 Pendant Set. Embellished with Mixed Stone, it gives a rich appeal. You can wear this set together or individually on western as well as traditional attire. This value-for-money combo is a smart choice.• Care label: Avoid of contact with water and organic chemicals i.e. perfume sprays. Avoid using velvet boxes, and pack them in airtight boxes. After use , wipe the jewellery with soft cotton cloth. • Note: The image has been enlarge for better viewing. • Disclaimer: Product colour may slightly very due to photographic lighting source or your monitor settings.